uuid : 67a2755d-2e66-40f0-9ef2-998a00019666 templates_id: 119510 templates_uuid: "0a57dc02-6712-47b7-965f-b962d07116d9" title: "Tenancy Agreement Template - Shorthold Tenancy Agreement UK" display_name: "Tenancy agreement for a house" description: "
Rent out your house safely using the most popular kind of tenancy agreement for private landlords, the tenancy agreement for a house. This straightforward assured shorthold tenancy agreement will help you avoid all the hassles and headaches of letting. This type of agreement also makes it simpler and quicker to evict tenants who fail to pay their rent or cause a nuisance. As a landlord, use this tenancy agreement to lay out payment terms, highlight your obligations in the rental of your house and clearly outline your tenants rights. What is a tenancy agreement for a house? A lease agreement is an assured shorthold tenancy (AST). It can be used if an owner of a property wants to rent it out. An AST is a type of tenancy that allows the landlord to charge a market rent and recover possession of the property on giving the tenant at least two months\' notice (expiring on or after the first six months). You will need this agreement if you do not live at the property and you want all tenants at the property to be joint tenants under one tenancy. This means that all of the tenants are jointly responsible for the tenant obligations in the agreement. You will need this agreement to set out the tenant\302\222s and your obligations. How many tenants can there be? There can be no more than three tenants (who are unrelated) living at the property. If there are more than three, the property could be classed as a House in Multiple Occupation (HMO). In these circumstances, you must comply with additional regulations and may need to apply for a licence- if you don\302\222t you could be fined. Will the tenant(s) need guarantors? A guarantor is someone who agrees to be legally liable for the tenant\'s rent and other responsibilities if they fail to pay. This is the period the agreement will run for and can be any length the you agree with the tenant, but the tenant has a right to stay in the property for at least six months. If a fixed term of less than six months is agreed, you do do not have a guaranteed right to possession if the tenant does not leave before the end of six months. Is there an inventory of fixtures and fittings in the property? An inventory is a detailed list of all of the items at the property and their condition. It is usual to provide a detailed inventory of the items in the property that the tenant can use. The items listed on the inventory must be left in the same state of repair and condition when the tenant vacates. If not, any deposit held can be deducted to cover the cost of any repairs. It is highly recommended that an inventory is made. Does the tenant need to pay a deposit? You can take a deposit to hold to cover the cost of any breakages or damage to the property or its contents. If when the tenant leaves there is no damage or rent due the money is returned. There are three authorised tenancy deposit schemes, two are insurance based and the third is custodial. All three schemes offer free help and assistance if there is a disagreement about the return of the deposit. There is no charge for landlords or agents to use the custodial scheme but the insurance- based schemes charge membership fees and insurance premiums. Landlords who fail to protect a deposit can be prevented from regaining possession of the property and can also be fined up to three times the amount of the deposit. The rent can be set at any level up to \302\243100,000 per annum in England and \302\24325,000 per annum in Wales and can be payable monthly or weekly. The level of rent will be the market rent similar to other lodgings and tenancies in the local area. This agreement assumes that the rent includes a cost towards the common areas (e.g. lighting the hallway, cleaning the common areas etc) but does not include outgoings (e.g. electricity and gas) and the tenant is responsible for a proportion of these costs. If there is more than one tenant renting the property (e.g. a couple or two friends), the rent in the agreement is the total rent for the property and the tenants are responsible for splitting any payments between themselves. The agreement provides that each tenant is responsible for the whole rent. This means that, if one tenant fails to pay, the remaining tenant is responsible for the full rent. Who can end the agreement? The tenant can\302\222t end the agreement before the end of the term. You can end the agreement by serving notice on the tenant but you can\302\222t obtain possession of the property during the first six months. \r\n\r\n\r\n\r\n" created_timestamp: "2018-10-08 04:36:31.0" modified_timestamp: "2018-10-08 04:36:31.0" active: true created_by: 102 modified_by: 102 dcm_id: 169 url_slug: "Tenancy-agreement-for-a-house" meta_description: "Create a tenancy agreement for a house if you are renting a house or have become a landlord. 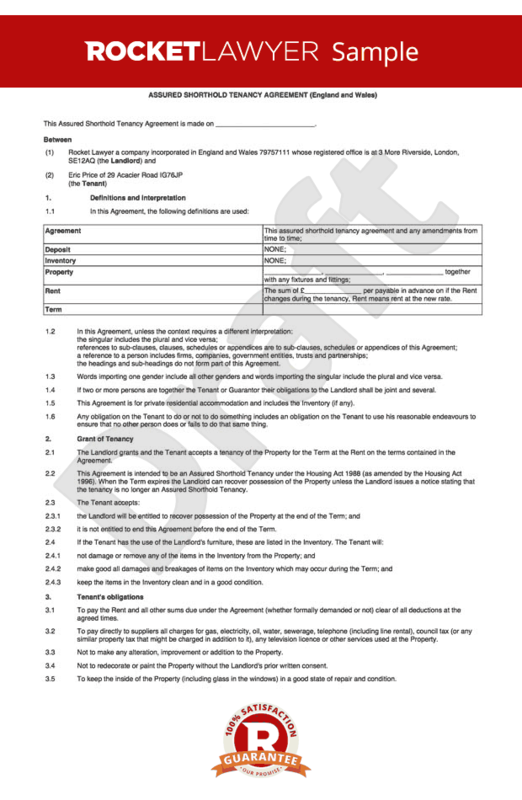 Try this tenancy agreement template with step-by-step guidance from Rocket Lawyer. " time_to_complete: "20 minutes" role1: "Landlord" role2: "Tenant(s)"
A lease agreement is an assured shorthold tenancy (AST). It can be used if an owner of a property wants to rent it out. An AST is a type of tenancy that allows the landlord to charge a market rent and recover possession of the property on giving the tenant at least two months' notice (expiring on or after the first six months). You will need this agreement if you do not live at the property and you want all tenants at the property to be joint tenants under one tenancy. This means that all of the tenants are jointly responsible for the tenant obligations in the agreement. You will need this agreement to set out the tenants and your obligations. There can be no more than three tenants (who are unrelated) living at the property. If there are more than three, the property could be classed as a House in Multiple Occupation (HMO). In these circumstances, you must comply with additional regulations and may need to apply for a licence- if you dont you could be fined. A guarantor is someone who agrees to be legally liable for the tenant's rent and other responsibilities if they fail to pay. All deposits must be placed in a Government Authorised Tenancy Deposit Scheme. Within 30 days of receiving the deposit, you must give the tenant details of the scheme and what is covered by the deposit. The rent can be set at any level up to £100,000 per annum in England and £25,000 per annum in Wales and can be payable monthly or weekly. The level of rent will be the market rent similar to other lodgings and tenancies in the local area. This agreement assumes that the rent includes a cost towards the common areas (e.g. lighting the hallway, cleaning the common areas etc) but does not include outgoings (e.g. electricity and gas) and the tenant is responsible for a proportion of these costs. The tenant cant end the agreement before the end of the term. You can end the agreement by serving notice on the tenant but you cant obtain possession of the property during the first six months. More than just a Tenancy agreement for a house template, our step-by-step interview and guidance makes it easy to create your document. Easily create online, download, print and sign your free Tenancy agreement for a house in minutes.